Arriving after the date above? If you come to this page after the test day is completed, your testing of Radeon is still valuable, and you can use the information on this page to test Radeon with your graphics card and provide feedback. If you are visiting after the release of Fedora 13, please wait for the next Radeon test day. Today's instalment of Fedora Test Day will focus on the radeon driver for ATI/AMD Radeon graphics cards. If you come to this page after the test day is completed, your testing is still valuable, and you can use the information on this page to test with your graphics card and provide feedback. /sbin/lspci -d 1002: | grep -iq VGA && echo "Join Radeon Fedora Test Day" || echo "Sorry, no Radeon graphics hardware found." Optionally, you may download a non-destructive Fedora 30 live image for your architecture. Tips on using a live image are available at FedoraLiveCD. You will need two or more monitors to perform the multihead test. These will provide more detailed testing of 3D functionality. Please file bugs for any failures you find if running these tests. If you have problems with any of the tests, report a bug to Bugzilla usually for the component xorg-x11-drv-ati. If you are unsure about exactly how to file the report, just ask on IRC and we will help you. Follow the instructions on this page to ensure you include sufficient information in the report. Once you have completed the tests, add your results to the Results table below, following the example results from Example user as a template. The first column should be your name with a link to your User page in the Wiki if you have one, and the second should be a link to your Smolt hardware profile (see above for a link with instructions on submitting your hardware profile to Smolt). For each test case, if your system worked correctly, simply enter the word PASS. If you had trouble, enter the word FAIL, with a footnote indicator, and put a link to the bug report in the comments column (as in the example line). If you could not perform one test (for example, you cannot perform the more advanced tests because the basic one fails, or you cannot perform the multihead test as you have only one display), enter the word N/A. In the comments column, you can enter the model name and PCI device ID (vendor ID is usually 1002) of your card, if you know it - you can usually find this information in the output of the command lspci -nn. ↑ Trying to rotate either of the two displays in multi head will crash gdm immediately. ↑ VT switch: Switching to console works, but switching back to the desktop yields a blank screen with a blinking cursor. 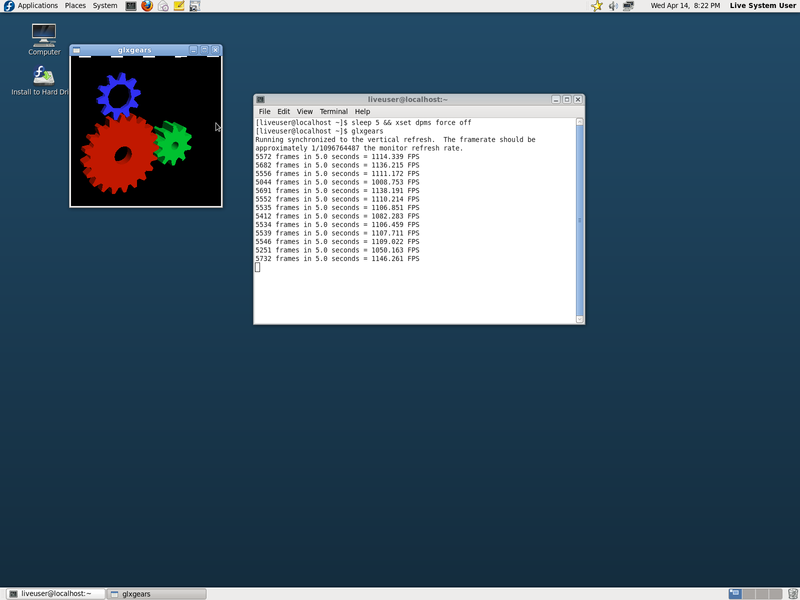 ↑ GLX: Gears work fine, Compiz crops spanned Deskop to the left 20%. Ok in clone mode. ↑ User switch: Black background for secondary user in spanning mode, ok in clone mode. ↑ rendercheck took about 75 minutes here. ↑ gstreamer-properties fails with: Could not initialise Xv output. Playing the sample Video in Totem works. Bruno Wolff FireGL V3400 (rv530gl) PASS PASS PASS Pending PASS PASS PASS PASS N/A Pending Pending Pending Switching from metacity to compiz dumped all of apps into the upper left desktop. I am not sure that's a bug, but it is annoying. During the vt switch test my X session was on vt7 not vt1. ↑ 1975817 tests passed of 2124238 total. ↑ System hangs when waking up, but graphics seem to work, so it might be something else. ↑ Small hesitation rendering video frame when returning from Totem fullscreen. Perfectly smooth with desktop effects on. ↑ rotate: Nothing happens on any option, no crash or anything. After enabling compiz everything work as expected. ↑ Poor performance in standart mode, good performance in compiz mode. Terry Barnaby HW FAIL [long 8] FAIL  PASS PASS PASS FAIL  PASS PASS  PASS  FAIL  PASS  N/A Thinkpad R52 with Mobility Radeon X300 1002:5460. ↑ When scrolling Firefox window behind xterm has display curruption (artifacts) in newly scrolled region. ↑ With multihead setup, see occasional screen flicker on primary display, particularly after changing display settings. ↑ Starting a game in fullscreen mode causes secondary display to be turned off. ↑ After disabling multi-head (disabling external VGA monitor), laptop display does not return back to native resolution (1400x1050) automatically. ↑ Shows garbage for a few seconds just before login screen, but everything works. If using "nomodeset" parameter it reboots just after showing login screen. ↑ XVideo: Full-screen mode not possible on right-hand display, but fine on the left-hand one. Video is ok if the player window is on the left half of the right display, but blanks when moved to the right half (border could be around 2048 pixels from the left margin of the spanned desktop). ↑ In the Totem window, the video playback preview disappears when paused, but all playback, seek, skip, etc. work normally and have no problems. ↑ The first suspension works fine; if I try to suspend the system again, Fedora switches to console, the system doesn't respond any more and it's impossible to wake it up. But it looks like this failure depends on the kernel (see RHBZ #583065). ↑ xvideo: When pause the ogg video in totem, about 20% of the image, on the left side, is missing/black. Image comes back on play. Only in windowed mode. This page was last edited on 26 June 2015, at 21:16.